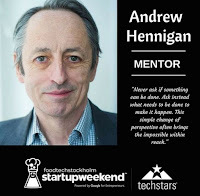 About that quote: "Ask What Needs to be Done"
Every mentor at Startup Weekend Stockholm is invited to provide a quote for the Instagram event campaign. For the February 2018 Foodtech event I chose a thought that I had just tweeted when I was asked -- an idea that I have found very useful for solving difficult problems. Never ask if something can be done; ask instead what needs to be done to make it happen. This apparently simple change of perspective is surprisingly effective because it reframes the question from one about possibility to actually finding solutions. When you ask yourself or other people if something is possible you allow the possibility that it is not. By asking how it could be done you concentrate all your efforts on finding some sort of solution.